Walking in the sun is one of my favorite activities. As is thinking about things to write. Today I’ll write about some things I like. 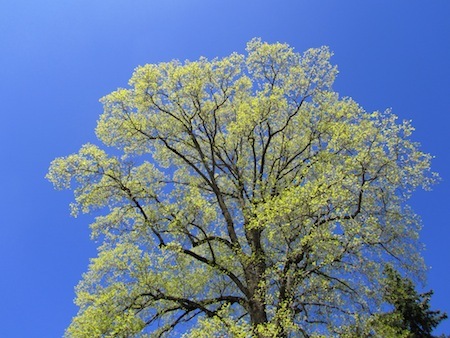 I like the way the new Tulip Poplar leaves glow in the sunshine against the stark blue sky. And the dark squiggly lines the branches make among them. 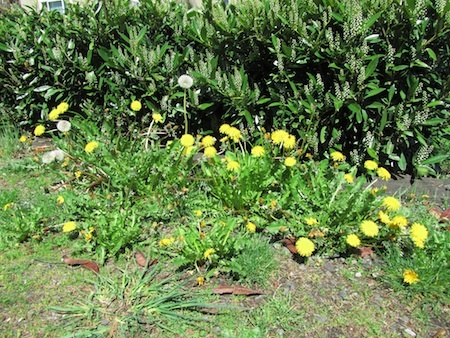 I like the bright yellow dandelions that have taken over the neighborhood. I like the large, brown and grey striped caterpillar that I saw sunning himself on the stem of a weed, perhaps it was wild lettuce. I’m still working to identify that one. I like the feeling of pebbles and stones, grass and warm cement under my feet as I walk. I like the satisfying ache in my muscles that reminds me of last night’s late night of Contact Improv Dancing. I like my little heater behind my back that takes the chill off as I type in my little room. I like being able to write and publish my thoughts to the world. Ahh. So many nice things in life.